Croft Wines was established in 1999 on 25 acres of the gravely soils of the Martinborough Terraces. 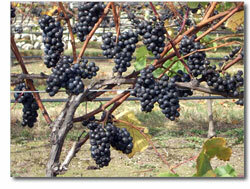 Initially, in 2000, the vineyard was planted with UCD 5 Pinot Noir clones. Subsequently, we added Chardonnay and Sauvignon Blanc. Pinot Gris is planted at our cellar door site at Kitchener Street. We began Croft Wines as grape growers. We started out with the goal of developing a quality vineyard as good as any in Martinborough. Even from the earliest days we knew we had the formula right: award-winning Martinborough Vineyard purchased most of our crops. As our volumes increased over vintages, the prospect of producing our own wine became viable and in 2005, we released the first wine under our own label. Today our releases include Pinot Noir, Sauvignon Blanc, an unoaked Chardonnay and Pinot Gris. What marks our wine as different is our approach to winemaking. Because we care intensely about what we do, we have eschewed high volume, high mechanisation, in favour of a lower volume, high quality product. We can truly state that Croft wines are made in the vineyard.